Was in the friend's car after midnight and he needed to wash his car. He said it's just too too dirty. The 'snow wash' splattering over the car, and I took a shot of it. Our friend said the cheapest car wash is $4 near his place is at Yio Chu Kang Road's Caltex. Momo said they wash their car cheaper. Momo and her dad gets coupon that gives them $3 car wash at SPC. But this car wash was $7. It's a 24 hour car wash and this is at Esso at Dunearn Road. So any of you know where the clean and cheap car wash are? Or which other car wash opens 24 hours? i dunno about sing, but in KL got dime a dozen. nice shot by the way.. reminds me of snow crystals on the window pane. On December 18 I escaped Europe just in time to fly to Singapore. Just in time before the snow storms. A week later I came back home. The snow had just melted, but since we have had 3 more periods of snow, very exceptional! The communities put salt on the roads to make the snow melt and when a lot of cars pass over it, it goes away. So we get salty sludge on the bottom of our cars. The only time I go to a carwash! In Belgium they ask 7 Euro, which is about 14 S$, but for cleaning the bottom, they add another euro. 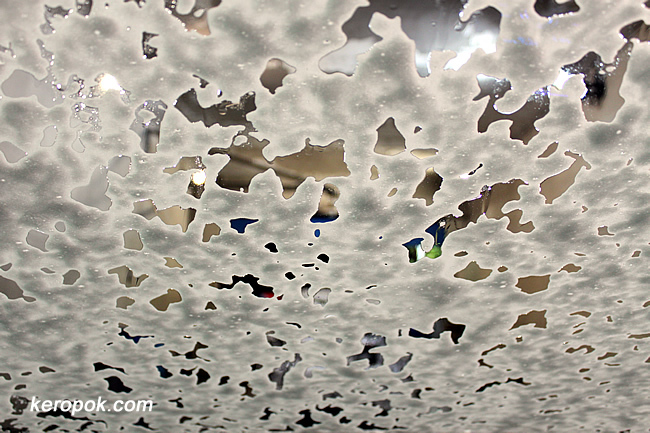 That is the connection between real snow and carwash. at the 1st BHP station abt 1.5km after toll booth.